The vaccine against tetanus allowed massive progress in controlling the disease. The result? A 89 percent reduction in tetanus cases and deaths since 1990. Tetanus can be contracted from dirt that enters through wounds, and can ultimately cause paralysis and death. When mothers or newborns contract tetanus through wounds during birth, this is called maternal/neonatal tetanus (MNT). It can be prevented by immunizing the mother who passes the immunity on to her newborn for a few days after birth. This entry presents a global overview on tetanus and MNT, presenting data on cases and deaths, and explaining transmission, prevention and the efforts to eliminate tetanus. Tetanus is caused by the toxin of a bacterium, Clostridium tetani, found in human and animal faeces, soil and street dust. The bacteria enter the body through wounds. Seven to 14 days after infection, a toxin is released from the bacteria and enters nerves responsible for movement and alters their activity. Specifically it prevents the release of the signaling substance GABA from nerve cells. Symptoms include, muscle stiffness, "lockjaws" (paralysis of the jaw), spasms, back pain and difficulties breathing. Tetanus is lethal in 13.2% of cases overall (including cases with and without treatment). Tetanus is one of the rare diseases that is infectious but not contagious or communicable. One can become infected with it, e.g. through dirt that enters wounds, but not transmit the disease to other people ("communicate" it). Even if the number of tetanus cases were reduced to zero at one point in the future tetanus would not be eradicated. As the disease-causing bacteria can be found in soil, unvaccinated people can become reinfected at any time. Continued vaccination efforts are therefore necessary to control tetanus. As a result tetanus is one of the very few infectious diseases that are not eradicable. For definitions of the words infectious, communicable, eradication and elimination, please see the definition section. The chart below shows that the number of new tetanus infections has declined globally since 1990. Worldwide the number of tetanus cases declined by 89% in this period. The majority of cases occurred in South Asia as is visible in this chart. And fortunately it is this world region that achieved a 96% decline between 1990 and 2016. Today most tetanus cases today occur in Sub-Saharan Africa where progress has been slower, but here too the number of tetanus cases declined – by 75% between 1990 and 2016. The number of cases and deaths caused by tetanus has been steadily declining over the last decades. The map below shows where tetanus infections occur. By clicking the play button you can see how this changed over time. In 1990 there was a high risk to contract tetanus in tropical Africa, in South and Southeast Asia, and in Haiti. By 2016 there were only five countries where tetanus still occurred at a rate of more than 10 per 100,000 people: Somalia, South Sudan, Kenya, Chad, and Central African Republic. You can see the change for individual countries by clicking on them or by selecting the "chart" tab at the bottom. In the bottom left corner of the "chart" tab different countries, as well as global data can be selected. As we have seen above, there has been a significant reduction in the number of tetanus infections. With this progress the number of deaths has also declined. In the chart below you can see the number of deaths by region from 1990 to 2016. Over this 16-year period, global deaths have declined from 333,000 to 37,000 in 2016. This is a 89 percent decrease. In the chart below you see death rates from tetanus by country. This is given as the number of tetanus deaths per 100,000 individuals, and is age-standardized to allow for comparisons between countries and over time. You can view the total number of deaths by country here. If tetanus is contracted, treatment involves antibiotics against the bacteria, antitoxin against the toxin, and spasm-control using drugs that enhance the effect of GABA, to reverse the effect the toxin had on nerve cells. Tetanus survivors still need to be vaccinated as the infection does not result in immunity to the disease. In the graph below you can see how global tetanus vaccine coverage increased rapidly from 38 percent to 77 percent between 1983 and 1990. Since then it has further increased to 86 percent in 2015. Prior to 1980, the number of tetanus cases had already declined in developed countries with good hygiene and immunization programmes. Since then, the global number of cases of tetanus and global coverage of vaccination against tetanus were monitored and allow a comparison. 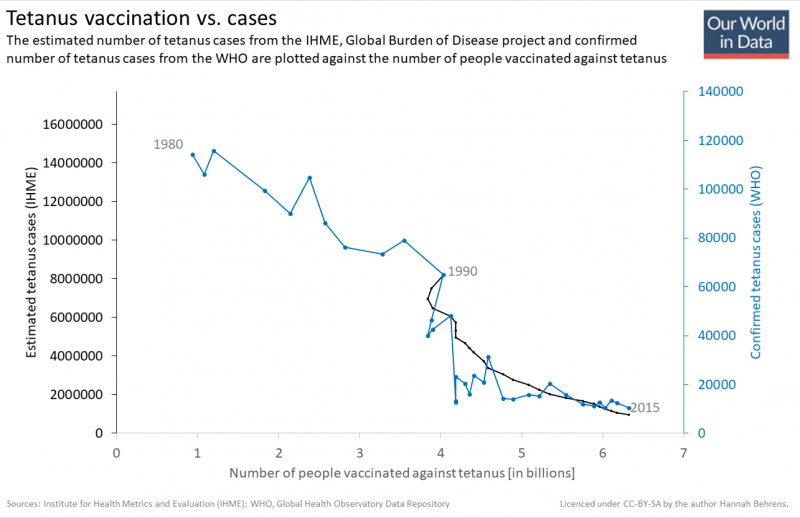 As the coverage of tetanus vaccination increased, the number of tetanus cases declined. In the graph below, tetanus cases (on the y-axes) are plotted against the number of people vaccinated (on the x-axis). Two different data sets on the number of tetanus cases are available. Starting in 1980 the WHO reported the number of confirmed tetanus cases. However, it&apos;s estimated that less than 10 percent of all cases are reported and confirmed. The Global Burden of Disease project has estimated the actual number (not just the confirmed) of tetanus cases from 1990. Both data sets agree that tetanus cases decreased as more and more people were vaccinated against tetanus. Below you can see how the distribution of neonatal tetanus cases changed across the world since 1980. According to the WHO&apos;s definition MNT is considered eliminated at a rate below one case per 1,000 live births.3 Based on this definition 45 countries eliminated tetanus between 2000 and 2017. This leaves 14 countries that have yet to eliminate tetanus, which are shown in red in the map below. (Please note the difference between elimination and eradication). Links to definitions below. By 1988 the WHO declared the goal to eliminate neonatal tetanus by 1995. The elimination standard was set to 1 case of MNT per 1000 live births. Due to slow progress, this goal was pushed back to 2000, then 2005 and eventually no specific goal was set. Instead the organizations Kiwanis and UNICEF partnered in 2010 to form the ELIMINATE project which aims to eliminate tetanus in the remaining 39 countries. Since the start of this project 25 countries have eliminated MNT, leaving 14 that have not eliminated MNT as of December 2018. To prevent MNT, mothers receive three doses of the tetanus vaccine, and through their blood pass on the resulting immunity to the child for the first days after birth. The child then needs to be vaccinated against tetanus itself, as immunity transferred from the mother fades. The international service organization Kiwanis records the latest progress towards MNT elimination on its project website. When comparing the number of new cases per year (incidence) as reported by the WHO and the IHME we can see a significant difference. The comparison between these figures are shown in the chart below. This difference occurs because the WHO only reports confirmed cases; cases that are unreported in any given country and cases that are reported in a country that does not submit its data to the WHO, are not included in the dataset. The IHME provides estimates which not only include confirmed cases but also estimates of unreported cases. Its figures are therefore always higher than those reported by the WHO. Centers for Disease Control and Prevention. (2018). Tetanus. Available at: https://www.cdc.gov/vaccines/pubs/pinkbook/tetanus.html. World Health Organization (2018) Maternal and Neonatal Tetanus Elimination (MNTE). Retrieved on 18 December 2018, from here. World Health Organization. (2018). Maternal and Neonatal Tetanus Elimination (MNTE). Retrieved 27 November 2018, from http://www.who.int/immunization/diseases/MNTE_initiative/en//.